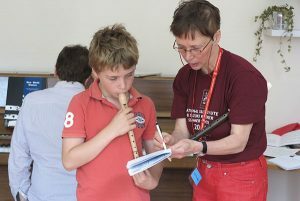 Many of you reading this will be hoping to build yourself a career around the recorder, and many of those will want to become established performers, bringing an appreciation of the unique virtues and repertoire of the recorder to a wider audience. But making a living as a performer is a tough call. There are remarkably few who can say that all or most of their income comes from playing in public or recording. For the rest, it usually means a mixture of performance and teaching. Given this fact, it is striking that all the leading music college courses focus on performing, with some sort of assumption that students will know how to teach, because they have been taught themselves. Given that this is probably the basis that their own teacher set off from, and theirs before them, the whole edifice begins to look like a house of cards. The other side effect of the focus on performance is that teaching tends to be seen as a necessary and secondary choice – hardly inspiring. I would say that this portrayal of teaching is completely inaccurate. It takes a particular type of character to become a top performer, but that character is not necessarily the one who will be an inspiring and talented teacher. It’s a case of ‘horses for courses’, and the two career paths will appeal to different groups of players. The problem comes in that all the players have been taught to perform, but they are all equally poorly-equipped when it comes to teaching. I am a fully qualified Teacher Trainer in the Suzuki Method. This is a well-established and successful method for teaching young children in a carefully structured way, to play beautifully at an early age. As we all know, the time that recorder is introduced is in Primary School. The class teacher marshals 30 five-year-olds with cheap, even toy, instruments, having read the next lesson in the tutor themselves the night before. The result is, of course, the stuff of parent nightmares. Imagine the surprise and appreciation that accompanies a concert of pieces that are largely in tune, played with good intonation, and entirely from memory. This is my regular experience, now that I am equipped with a system for achieving reliably consistent results. 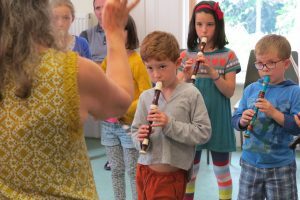 By the time these young players are teenagers, they will have a firm grasp of a broad swathe of the recorder’s natural repertoire of baroque music, and will be completely accustomed to performing in public. The problem with teaching an instrument to young children is that they are simultaneously challenged by intellectual hurdles in the form of written music and the physical difficulties associated with the co-ordination and manual dexterity required to play the instrument. The Suzuki Method addresses this situation firstly by setting out without any written music, relying entirely on the in-built ability all children have to learn languages by imitation. The written music comes in later, once the technique of playing is well established. Then a particular method is used to gain the co-ordination needed, in a structured, yet musical and fun way. This lays a solid foundation on which to build their musicality and technical ability. What I hope I’ve communicated is that teaching is a very specific art that requires its own skill sets and training and that being a great player doesn’t automatically mean you will be a great teacher. 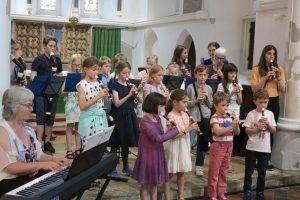 I also want to say how hugely rewarding it is to inspire a love for music and an ability to draw a beautiful sound from the recorder in a generation of young people. Teaching is a lot more than a part-time job for aspiring performers – it is a leadership role in inspiring and equipping a future generation of performers… and teachers. The training to become a Suzuki Teacher is part-time and can easily be combined with other work.